Enzymes are natural biocatalysts, produced and harvested from living organisms such as plants, animals, bacteria, and fungi. Diagnostic specialty enzymes are used in low volume and high value-added applications. Applications of diagnostic specialty enzymes include clinical chemistry, molecular diagnostics, and immunoassay. Based on product, the global diagnostic specialty enzymes market has been segmented into protease, carbohydrases, polymerases & nucleases, lipase, and others. The global diagnostic specialty enzymes market was valued at US$ 686.2 Mn in 2017 and is anticipated to expand at a CAGR of 7.5% from 2018 to 2026 to reach US$ 1401.7 Mn by 2026. Rapid growth of the global diagnostic specialty enzymes market is attributed to increase in the use of enzymes in biotech & diagnostic applications, surge in investment, rise in prevalence of chronic, infectious, and lifestyle diseases, and early and instant diagnosis of life threatening diseases. The number of patients inflicted with infectious diseases and other lifestyle diseases are increasing. For instance, the data compiled from the CDC, the WHO, The American Heart Association, the International Diabetes Federation, and Partnership for a Healthier America indicated that 33.5% of people in the U.S. suffer from high cholesterol and 387 million adults have diabetes due to which there are about 17.3 million deaths per year. Specialty enzymes are employed in various diagnostic applications such as DNA manipulation and sequencing. Decline in cost of DNA manipulation and sequencing is projected to drive demand and increase usage of enzymes in research and biotechnology and diagnostic applications. Increase in geriatric population in the developed countries is also anticipated to propel demand for diagnostic enzymes. Diagnostic and research & biotechnology enzymes will witness the fastest growth, as advances in diagnostic tests due to decline in DNA sequencing costs are likely to lead to increase in testing in agricultural, food, and medical applications. Moreover, large pharmaceutical companies continue to boost research and development spending on biologics to expand their new drug pipelines. The global diagnostic specialty enzymes market is in the growth stage. Major players such as Codexis, Inc., Amano Enzymes, Inc., Biocatalysts Ltd., and Advanced Enzymes Technologies Ltd. have strong presence in the global diagnostic specialty enzymes market. In the past few years, the global diagnostic specialty enzymes market has witnessed high investments by various multinational enzyme manufacturers such as F. Hoffmann-La Roche Ltd., Novozymes, Codexis, and Biocatalysts. The global market is driven by continued investment in biotechnology and genetics, as pharmaceutical companies rely on biotechnology to overcome difficulties in bringing successful new small molecule drugs to the market. For example, in 2017, Codexis, Inc. spent US$ 29.6 Mn on research and development (25% higher than that in 2016). The company primarily invests in research and development for the development of diagnostic enzymes. Additionally, rapid medical devices provide instant results and preferred by majority of people for early diagnosis of diseases. Early diagnosis enables people to avail better treatment options. The Clinical Infectious Disease division of Oxford Journals stated that every year thousands of adults and adolescents die or are hospitalized due to diseases that could have been prevented by vaccination. The global diagnostic specialty enzymes market has been segmented based on product, application, and region. In terms of product type, the market has been classified into carbohydrates, oxidases, polymerases and nucleases, protease, lipase and others. The polymerases and nucleases segment is projected to lead the market and is expected to continue to dominate the market during the forecast period. Rise in usage of polymerase and nuclease enzymes in advanced biotech applications such as DNA sequencing and DNA amplification fuel the growth of the segment. The oxidases segment is likely to lose market share during the forecast period. In terms of application, the clinical chemistry segment is expected to continue to dominate the market from 2018 to 2026. Blood glucose monitoring was the leading sub-segment of the clinical chemistry segment in 2017 and is likely to account for major share during the forecast period. North America captured the largest share of the global diagnostic specialty enzymes market in 2017. Increase in adoption of new biotechnology technologies such as next generation sequencing along with higher awareness, significant research spending in overall national budgets boosts the growth of the market in the U.S. Asia Pacific is projected to gain market share during the forecast period and is likely to be the key region in terms of revenue in the next few years. Development of health care infrastructure, rise in population, growth of the biotechnology industry, and increase in burden of diseases necessitating diagnostics in Brazil, South Africa, Saudi Arabia, etc. are likely to fuel the growth of the market in Latin America and Middle East & Africa. The global diagnostic specialty enzymes market has been segmented based on product, application, and region. In terms of product, the global market has been classified into protease, carbohydrases, polymerases and nucleases, lipase, and others. Based on application, the global diagnostic specialty enzymes market has been categorized into clinical chemistry, molecular diagnostics, immunoassays, and others. In terms of region, the global market has been segmented into North America, Europe, Asia Pacific, Latin America, and Middle East & Africa. The research is a combination of primary and secondary research, conducted for understanding and arriving at trends used to forecast the expected revenue of the global diagnostic specialty enzymes market during the forecast period. Primary research formed the bulk of the research efforts, with information collected from in-depth interviews and discussions with a number of key industry experts and opinion leaders. Secondary research involved study of company websites, annual reports, press releases, investor presentations, analyst presentation, and various international and national databases. The report provides estimated market size in terms of US$ Mn for products, applications, and regional markets for the period 2016 to 2026, considering the macro and micro environmental factors. The revenue generated from each product and application was calculated by considering the diagnostic specialty enzymes market product sales. The report comprises an elaborated executive summary, which includes a snapshot that provides information about various segments of the market. It also provides information and data analysis of the market with respect to segments based on product, application, and region. 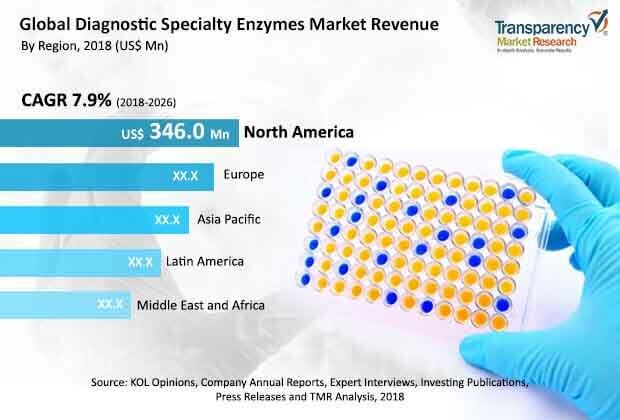 The overview section of the report analyzes market dynamics such as drivers, restraints, and opportunities that influence the diagnostic specialty enzymes market in the current and future scenario. The report also provides Porter’s Five Forces Analysis, the acquisition timeline of the diagnostic specialty enzymes market companies, SWOT analysis of the market, key vendor and distributor analysis, and comparative analysis of the diagnostic specialty enzymes market. Market share analysis of the market players is analyzed to signify the contribution of these players in the market in terms of percentage share. All these factors will help the market players to decide business strategies and plans to strengthen their positions in the global market. Based on region, the market has been analyzed for five major regions: North America, Europe, Asia Pacific, Latin America, and Middle East & Africa. The study also covers detailed country analysis contributing majorly to the diagnostic specialty enzymes market. The report also profiles major players in the market in terms of various attributes such as company overview, financial overview, product portfolio, business strategies, and recent developments. Companies profiled in the diagnostic specialty enzymes market report are F. Hoffmann-La Roche Ltd., Codexis, Inc., Amano Enzymes Inc., Biocatalysts Ltd., Advanced Enzymes Technologies Ltd., Amicogen, Inc., Amano Enzymes, Inc., Affymetrix, Inc. (Thermo Fisher Scientific, Inc.), and American Laboratories, Inc.